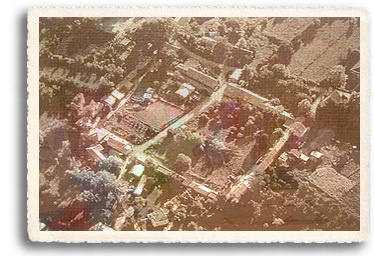 The name Chimayo derives from a Tewa name for a local landmark, the hill of Tsi Mayoh. This tiny village, set in the foothills of the Sangre de Cristo Mountains about 25 miles north of Santa Fe, was originally established as a penal colony for the Spanish Empire after their reconquest of New Mexico in 1680. At that time, Spanish colonists settled in the northwestern section of the Chimayo Valley. These hard-working and hardy settlers were farmers and weavers. They raised horses and sheep, and kept fruit orchards. They settled the Chimayo area in hopes of receiving the title of "Hidalgo" (or nobleman) if they prospered. Frequently they were granted land, money and farming implements to help with their struggles in the harsh, dry climate of the high desert. Chimayo is a town of numerous plazas and placitas. Plazas were rectangles of connected rooms surrounding an open space used as a community vegetable garden. Plazas were originally built for defensive purposes to protect the colonial farmers from raiding Comanches and other tribes. Of note is the fortified Plaza of San Burenaventura, now called the Plaza del Cerro, built in 1749. Today it is the last surviving Spanish fortified plaza in the United States. The Plaza del Cerro is a square built of connecting adobe buildings with two narrow entrances. A watch tower, or torreon, is set on the south side, while a small chapel sits on the western side. There were originally no windows on the outside, and adobe watchtowers probably stood outside each of the walls at one time. The two small entrances, (described as no wider than an ox) on the north and south could be easily and quickly closed to keep out attackers, and the residents could have survived for some time in the plaza interior, although enemies would have had an easy time cutting off their water supply. Plaza del Cerro has one of the oldest intact crop irrigation canals, or acequias, possibly built by Indians prior to the coming of the Spanish. Acequias are the life-blood of Northern New Mexico's agricultural areas, funneling snow melt or river water to fields and pastures, where it is allowed to flood agricultural land. Spanish settlers always built their plazas next to these canals, which had diversion channels running into the plaza gardens. Crops inside and outside of the plaza were watered by raising or lowering small gates to channel the water. The Potrero plaza of Chimayo is known internationally for its tiny chapel and shrine, the Santuario de Nuestro Señor de Esquipulas, commonly known as el Santuario de Chimayo. El Santuario de Chimayo has become known as the "Lourdes of America," for its legendary healing powers based on the miracle of Nuestro Señor de Esquipulas. This small chapel attracts close to 300,000 visitors a year, most of whom take away with them a bit of the "holy dirt" from a small well in the sacristy. The Santuario also attracts thousands of pilgrims who walk dozens, and sometimes hundreds of miles each Easter week to offer prayers of thanks and ask for blessings. El Santuario de Chimayo is the most important Catholic pilgrimage center in the United States, and was designated a National Historic Landmark in 1970. 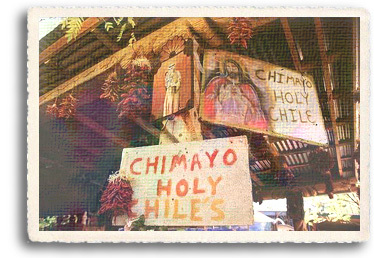 Chimayo is also famous for its heirloom chile (Capsicum annuum "Chimayo"). Of all the crops grown in and around the plazas, none was more important than chile. Chile was not only a food but also a medicine. For cooking, many preferred the milder varieties, and Chimayo is best known for its mild but extremely flavorful peppers. Farmers watched their chile crops closely, not only for harvest, but also because chile was used as a currency for barter, the only crop which was considered valuable enough to be used for this purpose. The tiny town is also well known for the weaving traditions of the Ortega and Trujillo families, who for generations have been producing textiles woven in the Spanish Colonial tradition. By the beginning of the twentieth century, weavings by the Ortega and Trujillo family artists had become so much admired, that the style was named the Chimayo style of weaving. The Ortega and Trujillo families now each operate their own galleries, along with those who still practice other traditional arts such as tin smithing, wood carving, and creating retablos, or paintings of saints on wooden slabs. Other traditional Spanish and Tewa Indian arts still found in Chimayo include bultos (sculptures), colcha embroidery and pottery. 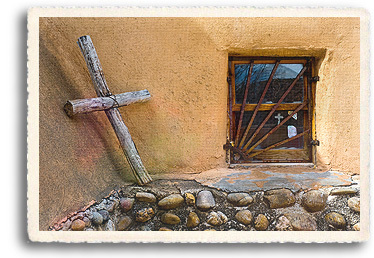 Chimayo is also home to numerous very talented contemporary artists as well. Set in the stunning high desert landscape and traditional adobe architecture, the traditional and contemporary artists of Chimayo attract a good deal of tourism to the area.